t was as if the capricious hands of fate pulled this antique Keris out of tombs of history to throw it into my life. Everything about it has been synchronistic and mysterious! It all started in the spring of 2002; I went out for a drink at a local watering hole here in Bali, to enjoy a moment of contemplative anonymity. Sometimes, I just like to go out to watch people and think things over. Well, that was the plan, but you know how plans go. You see, when I got to the door a group of burly security guards surrounded me. These guys weren’t just big; they were huge! No, I wasn’t being accosted or in any trouble. All they wanted was the usual. It didn’t take long before these guys were jockeying their hands out in front of me. Fighting to get the best spot. Each one of them wanted to be the first one to get their hands read. As you may have gathered, Fortune Telling (Ramal) is extremely popular here in Indonesia. I’ve helped the police solve a few cases, and have a reputation for having unusual, if quirky paranormal talents. I wish I could just tell you that I did the reading and went on to have my cherished moments of contemplative voyeurism. But that wasn’t what happened. Even so, I’ve digressed enough. The antique keris didn’t come into the picture until the next morning, when one of the guards dropped by my studio in Sanur. Curious but not surprised, I wondered who the guy was that was with him, and couldn’t image what he was carrying. His buddy was holding something bundled up in a bunch of sheets. It turns out that the guards friend was policeman. They sat around the table with me drinking coffee, exchanging the usual pleasantries and all but ignoring the large shrouded object. It was odd, it seemed like they wanted to talk about everything except the pink elephant in the room, the package. You have an unfair advantage, because you’ve already guessed what was wrapped up in the sheets. But, I didn’t have a clue. After an hour or so of beating around the bush, subtly trying to get it out of them, I finally just asked them what it was. Pak Dwi, the policeman, began telling me about his uncles dream, about the wizened old man had come into his uncle dream to show him where to dig a new well. Eventually, after he was well into the story, Dwi began unwrapping the sheets. Once, the sheets had all been unwrapped, a pleasant scent drifted through the room. The keris was laying blackened with age, resting on a bed of rice grains, herbs and dried flower. It was laying there blackened with age, resting on a bed of rice grains, herbs and dried flowers. It wasn’t like any keris that I’d ever seen. Yet, what was truly amazing was the energy. The air seemed to come alive with static electricity. You know, kind of like the feeling you get when you’re in the midst of a lightning storm. The keris was coated with a thick, blackened layer of patina, but fingerprints were clearly visible. 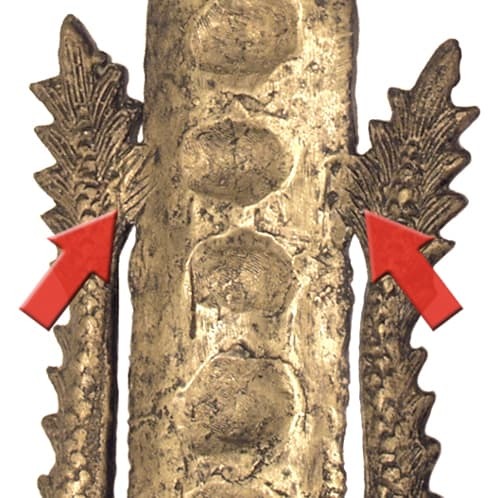 The fingerprints, pressed into the metal, are encased in the 28 indentations that run up the central spine of the blade (See Image Below). Most people expect to come across curving blade Keris’ because they are much more common. 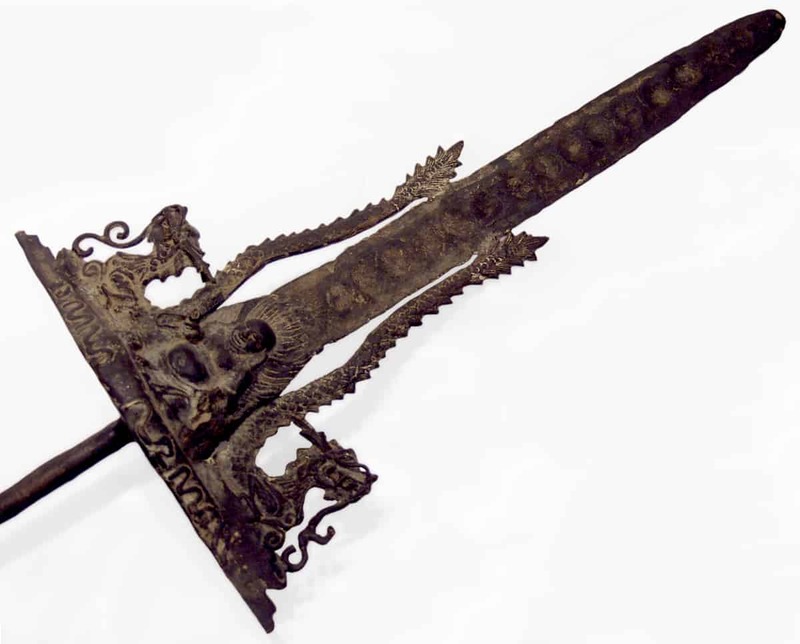 So, the straight edge of this antique Keris makes it a very rare specimen, that could just as well be called a sword. History and legend seem to have been forged together in the molten alloys of the Sacred Keris. In the Far East, and particularity the Indonesian Archipelago, Keris’ are imbued with special power. They’re considered to be magical implements and still today; Keris’ are used in the ceremonies held here on the island of the gods, Bali. Antique Keris’ were crafted by the master smiths of bygone ages; during a time when metallurgy was just as much of an alchemical art as it was a science. These mage like smiths were said to have been able to shape blistering hot metals with their bare hands. One technique that was described to me involved a smith moving his hands up and down the blade. As he moved his hands, he’d quickly pinch the edge of the keris between his thumb and index figure to infuse it with extra Chi. This kind of fire working might seem far-fetched to those of us who have been brought up with a western mindset. But, when you think about it, hand working red hot alloys isn’t that different from fire walking. Not too long ago, the idea of fire walking would have been dismissed as childish fancy. However, now that Tony Robins has led millions of people over 1600 degree coals, firewalking has been all but accepted as a real phenomena. I can’t say that the mystical technique described above was used to make this Keris. It was just an example, but you can clearly see the fingerprint incased in each of its indentations. I not an expert on antique Keris’ or swords. To unravel the rich and mysterious heritage of this piece, which is far from complete, I’ve had to rely on my understanding of ancient eastern tradition, symbolism and Indonesian history. Besides examining the symbolism, patination, and its telltale tool markings, we’ll also consider its providence and the extraordinary circumstances behind how the Keris was found and unearthed. One of the things that you can’t tell from the photos is just how heavy the sword is. It would have taken a giant to swing because at 13 kilograms, it weighs nearly 30 pounds. The ornamentation also would make it an extremely unwieldy weapon. The blade of the Sword is 46cm long with a maxim breadth of 6cm and a thickness of 5mm. The hilt excluding the dragon nagas is 14cm long with a breadth of 35cm and a thickness of 15cm. The base, blade and handle appendage together give a total length of 94cm with an approximate weight of 13kg. This may seem puzzling, because what good is a keris that you can hardly carry? Before you finish reading about it, you’ll understand why this is in and of itself hints at one of the final chapters of its long heritage. You can’t help but notice the Keris’ over-sized ornamental guard. It’s symbolism hints at the civilization and culture that produced it. Yet, as you shall see, we’d be wise to reserve our judgment because things aren’t always as straight forward they may seem. As you can see, an illustrious image of the Buddha is featured at the center of its base. With lines of energy pictured emanating upward behind him, the Buddha sits with his left leg tucked under and his right knee raised. This image of the Buddha distinctly contrasts the stiffer style of the Buddhist figures found at the Borobudur Temple. In fact, he’s somewhat reminiscent of the Buddha carved in the stone of the Felai Feng Gottoes at the Lingyin Temple, China’s oldest Buddhist Monastery. 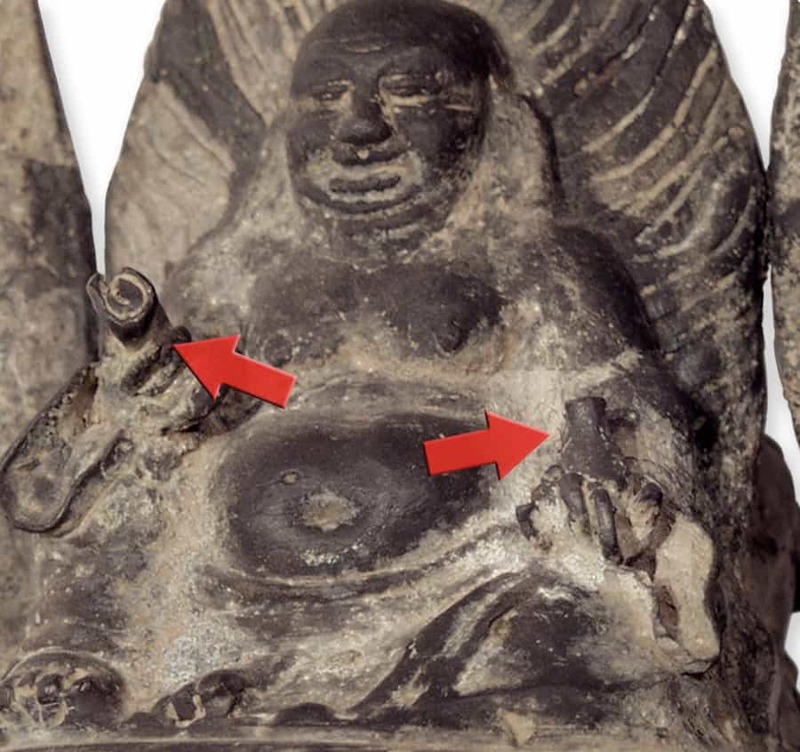 What isn’t easy to tell is that the Buddha is holding a Scroll in his right hand and a medicine bottle in his left. The Buddha is flanked by two reared back Dragons, rendered in the early classical style of Indonesian art. The Dragon is a primordial image that harkens back to the first shimmers of time. Its transformation into the style of dragon that we have become familiar with emerged somewhere between the Huai and Han period (202 BC.-226 AD.). Across the Indonesian archipelago snakes and dragons are common artistic themes and they generally referred to as ‘Naga’ the Sanskrit name for dragons. 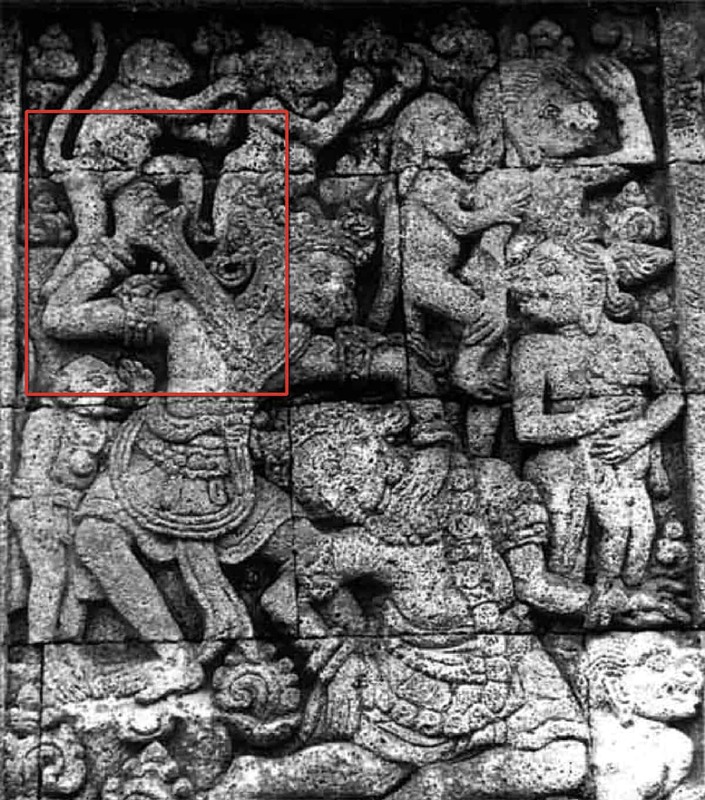 However, it appears that in Indonesia the Indian Naga not only thematically interbred with the Chinese dragon, but other distinctions also arose with other fierce creatures. Beneath the glyph, you’ll notice what appears to be a band of wavy lines going across the base of the guard. It turns out that these may not be simply random lines. They’re closely resemble raised letters from Kawi, an ancient Indonesian language. 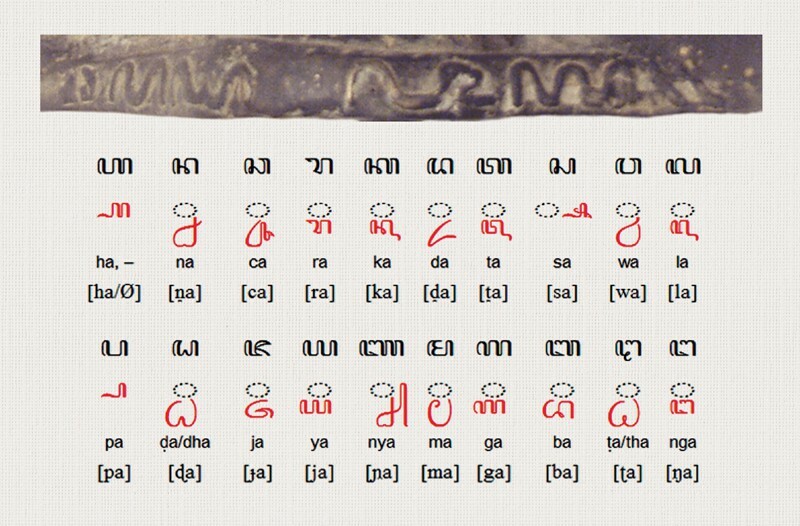 Though originally developed from Pallava, the Javanese Language acquired a distinct form of letters, the Kawi Alphabet around the 10th century of the common era. I haven’t had the letters examined by an expert, but informed sources tell me that they correspond to the Latinized syllables, Da Pa Va Ja. Just like the famous swords you come across in famous epics like the Hobbit, it was a common practice in Java to name Keris’ of power. Da Pa Va Ja isn’t only a mantric sound formula, but also translates as “Victory to All”. 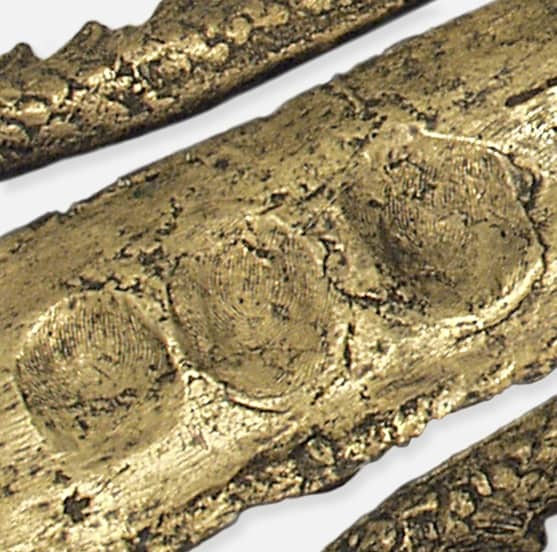 Some would consider this to be a Proto Keris because it’s of bronze like mix of alloys. Yet, if we take into consideration the symbolism of the guard, it would be easy to conclude that this ancient Keris was a rather elaborate example of a Keris Sajen. 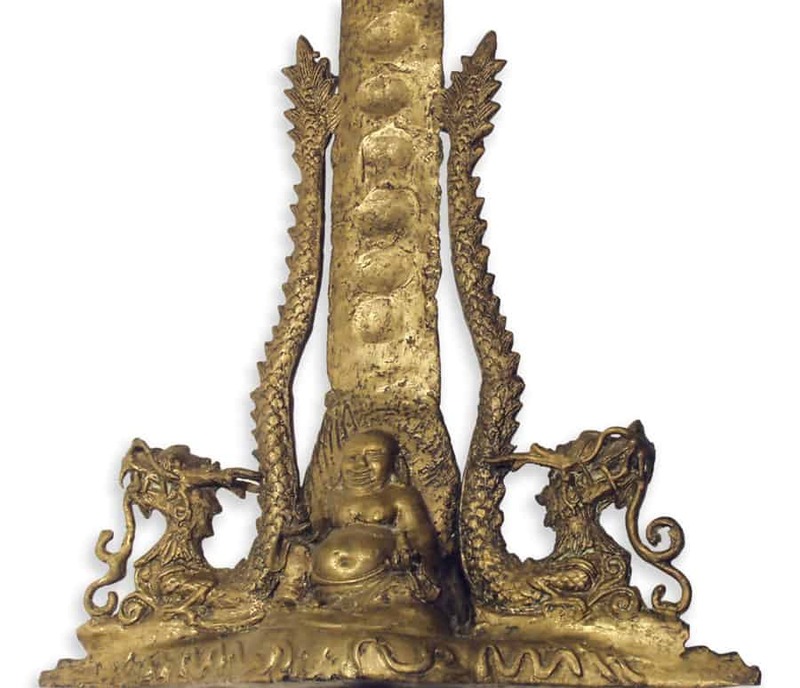 Similar to the Buddha guard on the Da Pa Va Ja Keris, the characteristic hilt of a Keris Sajen often features a squatting human figure with arms on the knees. Rather than strictly a weapon, the Keris Sajen is considered to be an amulet of sorts. With the elaborate ornamentation of its current form it’s doubtful that this Keris could have been used for anything other than a symbolic implement. However, in the same way that sacred pagan sites and objects in the west were re-purposed during the Christian era. Tell tale signs suggest that this Keris may have originally served a very different purpose. It was common practice in the ancient world to incorporate sacred or exceptionally powerful objects from previous eras in new ways. So is certainly possible, if not probable, that this Keris was re-purposed when Buddhism rose to prominence in Indonesia. 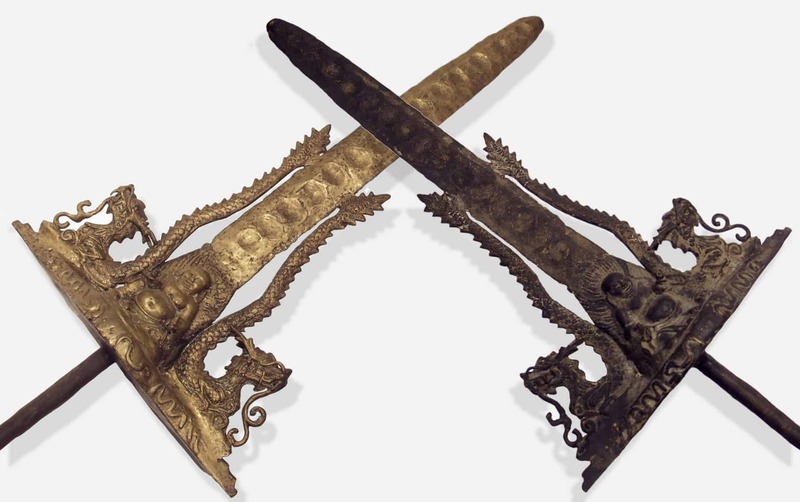 In fact, my research suggests that the guard of the Keris is likely the product of the Salendra Dynasty, while the blade of the Keris comes from an earlier period, when the Sanjaya kingdom was in power. The elongated, slightly tapering shape of it’s blade is characteristic of the early Classical Period (from the 7th to the 9th century). A period of Javanese history that was heavily influenced by the Indian culture. A temple relief from Candi Panataran shows Hanoman, the Monkey King, using a straight edge dagger with a similar blade. Candi Panataran is the largest Javanese Hindu temple complex in East Java. Its base carries reliefs telling the story of the Ramayana. The patina on the Keris is also even spread across its entirety. However, when you look closely at the side that I restored, you can clearly see a seam between the blade (wilah) and the guard. The flanking dragons also appear to have been similarly conjoined, suggesting that the blade perhaps did originally have a different guard. 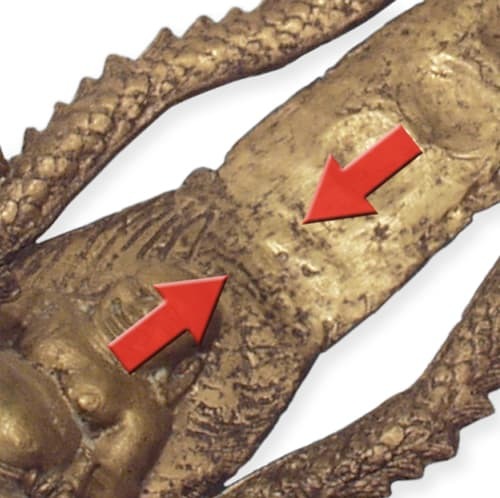 The seams indicated in the images to the right, seem to suggest that the blade may have originally had a different hilt. No matter how much we’re able to piece it’s legacy back together, somethings about this Keris will remain a mystery, hidden by the mist of time. The policeman, Pak Dwi, brought to my studio because he wanted me to use my extra ordinary abilities to find out more about it. He told me how an an old man had appeared to his uncle in a dream. In the dream, the old man told his uncle that he should dig a well and showed him where to dig. So the uncle followed the old mans instructions and the very next day he began digging a well. After a week of digging he started to doubt the dream because he still hadn’t struck water. Yet, he kept at it and when the hole was around ten meters deep he uncovered this Keris. After unearthing it strange things started to happen around his house and the entire family was terrified of it. He passed it over to Pak Dwi who is stationed here in Bali. Pak Dwi in turn brought it to me. I was more than a little intrigued by the Keris and could feel energy emanating from it. So I used a pendulum to find out more about its heritage and zero in on how old it was. According to the test, the blade turned out to be around 1280 years old, dating it to the 8th Century. The test also indicated that the Buddha guard of the Keris was only 1100 years old. Apparently it had been only been affixed 180 years after the blade had been made. Pak Dwi wanted to leave it with me because he also didn’t want it in his house. I had a collector that may have been interested in it and put on my alter. Yet, soon after the Bali Bomb went off, and my collector friend never showed up. Months turned to years and I finally ended up purchasing it from Pak Dwi for a fair price. It wasn’t until later, when I removed the patena from one side of the Keris that the seams pictured above became evident. It seems that Keris was buried beneath hot volcanic ash because it’s so thick and stubbornly hard to clean. Two of my jewelers worked an entire week just to strip back and restore one side. I’ve had it for over a decade now and have much more I could tell you about it’s peculiar and protective influence. Yet, I’ll save that for when we meet in person or can speak over Skype. I have moved from my Studio in Sanur, and it is time for this extraordinary Keris to move on as well. Price by request only. If you are interested in purchasing the Antique Keris please get directly in touch with me by using form below.